A dumpster is for trash, right? Well tell that to some people. This is the tale of Jack. It was a school day. Same morning routine…brush your teeth, eat breakfast, get dressed, kiss your parents and off to school he goes. 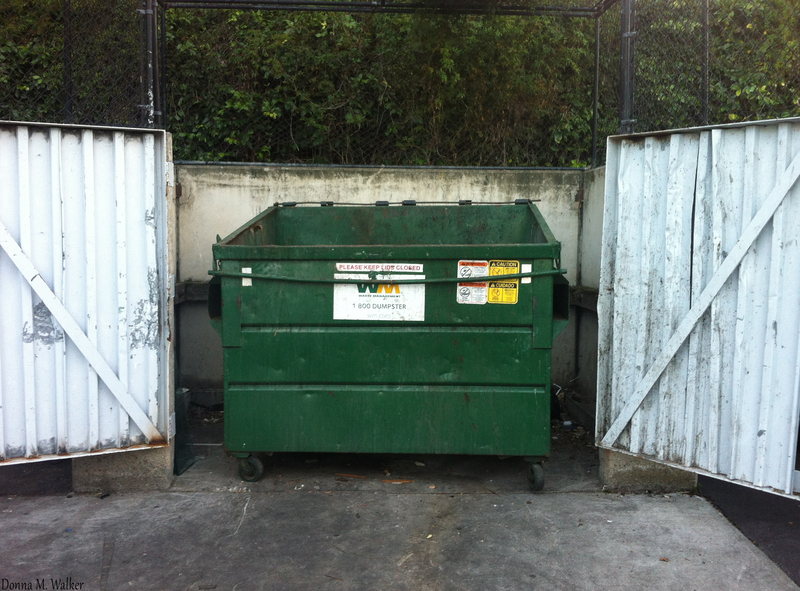 He went out the same door and through the parking lot and pass the dumpster as he always did. Only this time he heard something from within the dumpster. It was a little dog. He asked his mother for help, got the little dog out of the dumpster and asked his mom if he could keep it. His mom said no, maybe because the apartment wasn’t big enough for a dog. But getting this dog out of the dumpster where he was helpless wasn’t enough for this little boy. He carried him all the way to school in his arms. When he arrived at school he told his teacher the story of how he found this little guy. The teacher let the dog stay there for the day in a kennel they had at the school. Later, they took him to check if he had a microchip or if there were any reports of a lost dog, but no luck. So, a teacher took this dog home with her until they could find a home for him. One of the teachers told her brother and his wife about the dog. The husband unsure if he wanted another pet, as they already had quite a few, agreed to go look at the dog, but they were NOT taking him home that night. They would look, leave, and think about it. They arrived at the teacher’s home that was taking care of him, she opened the kennel door, the dog came running out and ran right up to the husband. There was no way this little guy was going to let them leave and think about it. They took him to the vet to get checked out and other than being dirty, some mites in his ears, and a little malnourished, he was pretty healthy. These things would be taken care of easily with some love and care. Now…back to where this story started. A little dog like this could not have gotten into a dumpster on his own. There was no platform for him to climb on to jump into the dumpster, so it is highly likely a human threw him in there. People can be so cruel! At least this tale does have a happy ending! Their daughter had wanted a Chihuahua (he was part Chihuahua), so she got her wish and this dog; they named Jack, got a forever home! Doesn’t Jack look right at home? This is a short tale about Charlee. Charlee is 8 months old. She had a family and a home. Sadly, one day when Charlee was in the backyard of her home, she somehow got out and into the street, and a car hit her. We don’t know the entire back-story. How she got out of the backyard or how much the surgery would cost. What we do know is her family could not afford the surgery Charlee required, so they brought her to a shelter. At the shelter, she received the necessary surgery; however, they could not save her back right leg. Once she recovered, she was put up for adoption. She now has a family again! They said that having 3 legs doesn’t slow her down at all. Whenever they are on walks, Charlee is always ahead of them. Go Charlee! Pets are family. No-one should have to give up their beloved pet because they can’t afford to pay for a medical need and animals depend on us to care for them. Red Rovers has “relief grants” available on their website that may be able to help you, or someone you know, with getting the care your animal needs if you cannot afford it. Click here for more information. If you are interested in helping someone else afford care for an animal in need, consider becoming an On-Call Angel. An organization took Cletus in until he was adopted. His new family even created a Facebook Page dedicated to him. Cletus was probably the last thing she had left that she was holding onto. We are assuming she has had him her whole life since he did have a unregistered chip in him and no other information given. We have created this page as the adopters of Cletus to bring his story to the public and all other pets out there that need a home. You can read the full story here and be sure to also check out the Facebook Page for the full “about” post, other posts and updates on Cletus. Side note: If you haven’t “liked” my Facebook Page, please consider doing so. I would appreciate it. My only concern with this story is it seems it would be safer to leave a dog (or any animal) at the Humane Society (hopefully a No-Kill one) than to leave them in a park where anyone can grab them. Let’s face it, there are good & bad people out there! This is why I have this blog. Check out the story and let me know what you think. This story made me think about animal shelters. It is so sad to hear about all the animals in a shelter. Some had previous homes, some good, some bad. Some were strays and have never had a home. There are so many stories. It breaks my heart when I read about a dog who is so scared in a shelter and just sits in the back of their kennel in a corner. I think how confused they must be. Then there is the “kill” and “no-kill” shelters. I found the following post from the PupJournal’s Facebook Page. What does “no-kill” really mean when it comes to pet overpopulation? Let’s start with a “no-kill shelter.” A no-kill shelter makes policy to not kill unwanted animals. In order to have this policy, the shelter does not accept every homeless pet that comes through its door. They turn pets away when there is no space to house them. They may also be selective in the animals they accept so as not to have to euthanize any of them. In fact, if they take in an unadoptable animal, they are committed to keeping that pet for its entire life if they can’t find a home, rather than euthanize it. Thankfully, they can do this wonderful work because there are shelters in the community with an open door policy, which means a shelter accepts all unwanted animals. But open door shelters are in the undesirable position of having to euthanize because there is not enough room to house them all. Sadly, they are portrayed as the bad guys. So officially, a no-kill community does not halt euthanasia; it only reserves it for those animals that are untreatable and unadoptable, most often because of aggression. It makes sense, but most people don’t realize what it means when they first encounter the term. · Not filling up the City’s animal shelter every day, so that smart decisions can be made about an animals care and future. · People fostering animals when shelters are full. · Everyone making a gargantuan effort to spay and neuter their pets. · Implementing low-cost spay/neuter programs. · Educating people about responsible pet care. · Increasing adoptions at shelters. · Allowing trap, neuter, and release programs to reduce the number of feral cats euthanized. · Getting lost pets home through affordable microchipping and IDs. Let’s face it, if one local animal control receives 100 unwanted pets daily and 90 of them are adoptable and treatable, that would mean 540 people would need to stop by each week to adopt a pet and prevent the shelter from having to euthanize any of those pets. That’s not going to happen: supply is still far greater than demand. While adoption saves lives, the prevention of unwanted births in the first place must be the primary goal of anyone committed to ending euthanasia. No kill is more than an idea, a concept, or a simple vote by city council. It is a community working together and understanding that to create an environment where thousands of animals are not killed each year, we each have to take responsibility for the animals we have and prevent their uncontrolled breeding. A “no-kill community” does not mean no euthanasia: it only means responsible euthanasia. I pray someday NO animals, absolutely NO animals, will ever need to be euthanized! I 100% agree that it is the responsibility of each community to help make this happen. The other thing I pray for, is that Biggie finds a home soon, and the shelter he is in will soon be able to add his name to this tree. Thank you Marcia for watching over him until that day comes. Please consider sharing this post so we can help Biggie find a home! End note: This story is similar to last week’s Tuesday Tale in that a human had to give up their dog because they could no longer care for them. How sad this is. Are there not enough resources to help people keep their pets? Does anyone know anything about this that you can share with me? I needed the kleenex for this one! Thanks, LeeAnn, for the post and education about shelters and the no-kill meaning. I found it very educational too! I also teared up when reading about Biggie. Biggie has such sad eyes. It’s heartbreaking. Woof… Love your blog and tales. Sad, wonderful, so much help is needed and help seems to manifest. . .these are greatly encouraging accounts! Humans brought about The Fall–animals didn’t, but they suffer the consequences of human failure. It is self-centered and heinous in the extreme to abuse, neglect, or destroy an innocent animal for the sake of human frustration or convenience! I know. I feel so bad for animals having to suffer because of and at the hands of humans. Ya’ll are, right, their suffering is so unfair, but while there are people doing horrible things to them, there are also a lot of people doing very good things for them! Maybe if people see good they’ll do the same and it will eventually spread around more. You’re right, there are people doing good things for them too! Thanks for your comment.